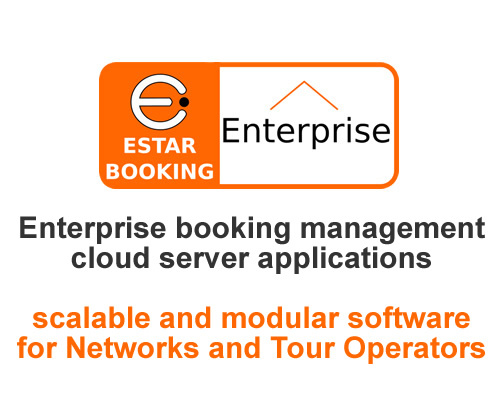 Estar Booking Enterprise, is the top cloud service management solution provided by Estar group, for Vacation Rentals networks, or Tour Operators companies. It’s Estar's more scalable and modular framework, and can also customized with dedicated flow management. The frameworks work on strong cloud server architectures, also supported by PCI DSS dedicated servers, in all those cases where it is necessary to store credit card data, related to its safe standard industry treatment. Direct API with Booking.com, Expedia, FlipKey, Atraveo. For Enterprise projects Estar group team is at your disposal for Customer needs evaluation, Analysis, Customized offers, online supported demo, delivery plan and related help desk service.